If you are looking for information on compressed air valves – this and other pages on this site provide a broad range of information about them. Before we start discussing air valves, if you are seeking information about Unloader Valves there is a page on this site explains unloader valves in detail. Unloader valves are not discussed on this page at all. Also, compressed air leaking from an unloader valve may actually be a symptom of a leaking compressor tank check valve. See the link from the troubleshooting page for information on how to fix this. Now, back to compressed air valves. A fairly simple air valve might be designated as a 2/2 air valve, or perhaps a 2/2 air valve. That designation might be followed by the letters N-O. This is what those designations mean. this compressed air valve has two working ports – one for air supply in, and another for air supply out to the application. An air piloted 2/2 valve might also have a third air port for the pilot signal to enter and shift the air valve. The first -2- in an air valve is designated as a 2/2, refers to the number of ports that valve has. The second -2- refers to the number of positions that valve will have. In the picture above, the second of the two air ports is hidden. It is directly opposite the port shown. I know that this is an NC valve, since I took the photo. You normally cannot tell by just looking at an air valve whether it is an NC or NO configured valve. Normally Closed (NC) means that when the valve is not being actuated, compressed air will not pass through it. 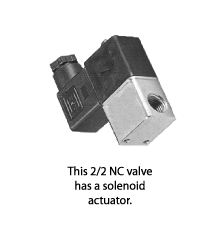 If the solenoid in the valve shown above is not getting an electrical signal, then the valve is in its resting state. It is not being actuated. Normally Open (NO) means, that when the valve is not being actuated, air will pass through it. It is “normally open”. There are some circumstances where an air circuit designer might want air to be flowing through a specific valve when the circuit is turned off, and in those circumstances, might specify a 2-2 N.O. air valve. More about 2/2 valves are on the pages of this site along with how to draw them for air circuit design. Next valve I will talk about is the 3/2 air valve. As noted earlier, the first number in the valve designation is the number of working ports that the valve has, and the second number indicates the number of positions that the valve has. A 3/2 air valve will have an in port, an out port (to the application) and an exhaust port, a total of three ports. The second number in the a 3/2 valve designation is a two, so this valve will have two positions it can be shifted into. At rest, the 3/2 air valve will either be open, with compressed air flowing through it and out the power or working port to the application, or it will be closed. When it is closed, compressed air will be stopped a the valve supply or in port, and the working port that let the air flow to the application when this valve was open, will now allow that same air to flow through the air valve to the exhaust port and out to atmosphere. Lots more information on 3/2 air valves and their uses on this site along with how to draw a 3/2 air valve. Next in the series is the 4/2 air valve. More complex air valves are required for more complex air-using appliances, and the 4-2 air valve is one of these. The 4/2 valve will have four working ports, and it will have two positions into which it can be shifted when actuated. See the pages on this site for more information on 4/2 compressed air valves and how to draw them. The 5/2 compressed air valve functions similarly to the 4/2. More information on the 5/2 air valve can be found on this site. The 5-3 is an even more complex air valve. ..just like the 5/2 valve. Rather than the two positions that most valves have however, the 5/3 valve will have three operating positions. Lots more information here on this site about 5/2air valves. See the pages for 5/3 configured valves and their applications, and to see how to draw 5/3 and 4/3 air valves . Regardless of the type of air valve your application needs, every single valve will have some sort of a valve actuator, or in some cases, valve actuators. If you have experience with compressed air valves, you will be comfortable with the term manual actuator. This simply means that the valve is actuated by an operator (person) that pushes a button, moves a lever, toggles a switch, to make the air valve shift. For complex air circuits that demand multiple and sequential operation of devices, the valve of choice will typically be solenoid operated. Please note that I define an operator as a person that actuates a valve, and an actuator (sometimes noted as external actuator) as the device on the valve that actually shifts it. This is my personal definition, and you may find that other people have different terms for the same thing. Make sure when you are talking to folks about valves that you understand their terms, will you? There are a number of specialty valves available for specific applications such as emergency stop valves, soft start valves, check valves, blocker valves and so on. There are pages on all of these on this site. For the novice, for the newcomer to the world of pneumatic fluid power, many of the terms used and products discussed will be confusing. I will clarify as much as possible, and continue to provide a huge amount of information on this site about those terms and products.